The Honeymoon is over…after 90 days! As your wedding day approaches, so does all the excitement about your big day! All that planning and preparation comes together to create one amazing celebration, filled with little moments and big memories that will last a lifetime. Your wedding day celebration is the talk of the town, the next big thing and what everyone is looking forward to sharing with you. One amazing day and one amazing night with one amazing couple. YOU! Now, your wedding day has come and gone and yes indeed, it was everything you could have dreamed of and more. But what happens now? What happens after your wedding day? Sadly, as each day goes by, little by little the newness and excitement about your amazing wedding begins to wear off…and then it’s back to business as usual. Reality and life sets in. The question is…how long does this joy, love, excitement and newness of your wedding last? How long after your wedding day are you still in the Limelight? How long will it be before your friends and family are no longer sooo excited about your wedding and everything related to it? Well, I believe the answer is different for different people. It really depends on who you ask. Your close friends and family will all likely have a different response to this question. But how about the guests who attended your wedding? How long will it be for them before they are “over it”? Ask them and I bet some of the responses may make you laugh! Ask yourself too. How long before you are over it and no longer want to do “wedding stuff” anymore? That’s what I really want to know…how long after your wedding day should (I, Me, Photographer) be excited about your wedding? 1 week? – 1 month? – 6 months? When is the “Honeymoon” period of your wedding day over for your photographer? Well, while I can’t speak for anyone else, I can tell you that for me, the Honeymoon is over…after 90 days. In some cases, up to 180 days. If you are reading this before your wedding day, this is also something to keep in mind when you are considering what the cost is for your photography or videography. To my knowledge, no other wedding vendors are still working on your wedding between 90 – 180 days after that one amazing day. The “honeymoon is over” sounds a bit cold…so let me try to explain this a little more. BEFORE THE DAY: Just as you are, we are SUPER excited about anything and everything related to your wedding! We are looking forward to seeing and capturing every single moment we can find, in order to provide you with a series of images that will tell the story of your day and allow you and your friends and families to relive every amazing moment, again and again, each time you see your wedding album and other images. WEDDING DAY: On the day of your wedding we are full of energy throughout the whole day and we want to help make your day fun, stress free and beautiful. We are down for whatever it takes to make your whole experience unforgettable and we want your friends, family and guests to also have an unforgettable day. AFTER THE DAY: 3 weeks after your wedding day, we are still super excited about all the amazing moments we captured. Your photos are now ready and we can’t wait to show them all to you, have you share them with your friends and family and we can’t wait to get started creating your gorgeous, amazing wedding album, wall portraits and other products you are going to order. We can’t wait to blog about it and post some of our favorite pics on social media for all the world to see, as we wait for you to choose your wedding album selections. That’s when the waiting game begins, the fun starts to fade and reality sets in for us. You see, here at our studio, we are very sure to inform each and every one of our wedding couples that they have only 90 days after their wedding to make their selections for their wedding album, gift prints and all other products from their wedding. It is even stated in our wedding contract. Now, some of you may say wow, 3 months is a long time! I don’t need that long…I can get it done way sooner than that. But believe me, all too often we are sending reminder e-mails, phone calls, texts and even feel like we are nagging some of our couples to get it done within the 3 month period. Most couples are good about this…while some are not. Why do we even have the 90 day deadline? For two main reasons. The first reason is strictly hard drive space. We have only a limited amount of space on our computer hard drives and servers for so many wedding photos and all of the other photos from our other photography services that we create for our clients. We are a full service studio and we specialize in weddings, but we also do other types of photography. A full wedding day takes up by far much more space on our hard drives than anything else we do and as much as we would like to, we can’t keep the photos on there forever. In order to make room for the upcoming work we have, we have to make room on our hard drives. How do we do this? Just like you do it at home. We go through and (gasp) have to delete the oldest jobs on our hard drives, in order to make room for the new photos and videos that will be coming. If we didn’t do this, we would need to own an Iron Mountain type company in order to store the many thousands of photos and videos we create each year. The second reason for our 90 day deadline is because after this time period, we have become extremely busy providing an equally awesome experience for our new clients, that we have to prioritize our workload. So, the further away your wedding day gets, the less time we have to devote to it. 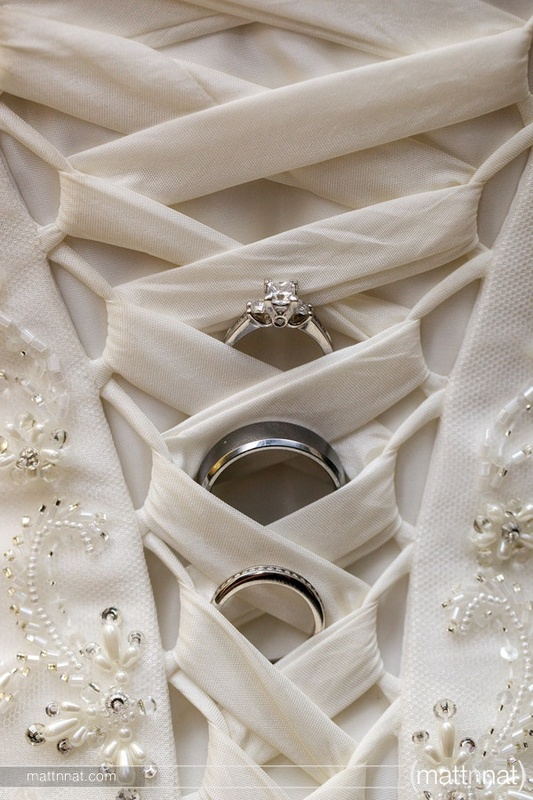 On your wedding day, you are top priority on our To Do List. Then, as each new job comes through, that client goes to the top of the priority list and your wedding moves down one notch. Each time we have another new client to photograph, your wedding moves down the list again…and again. 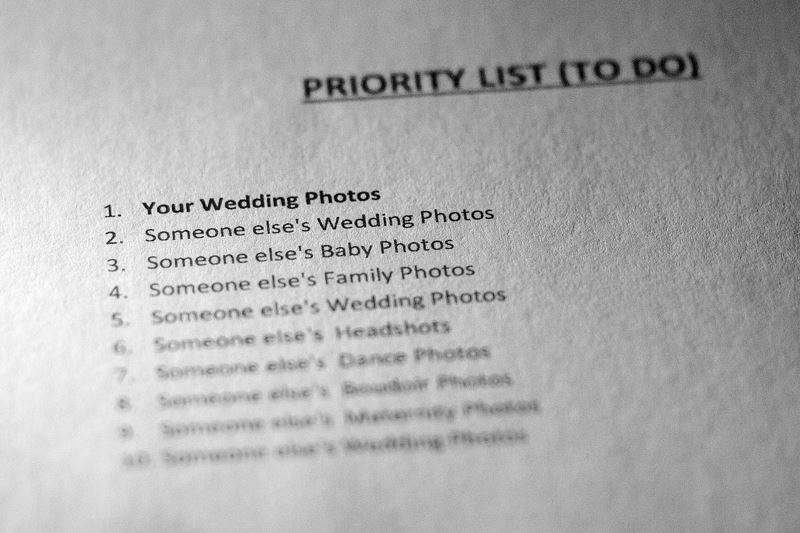 Your wedding photos are at the Top of our To Do List right after your wedding day. The key to making sure that you stay on the upper end of our to do list, is to do work on your end. Do your homework. Pick your thank you card photos, gift prints, wedding album selections and all other products you would like to order, within that 90 day period after you have your proofs and they are also online. That will ensure you have your products back faster and you don’t end up at the very bottom of our to do list. The 90 day online gallery that we offer with every wedding package is a good tool to help you keep track of how much time you have left. You will receive several reminder e-mails about your wedding photo gallery and even one that tells you when you only have 10 days left before the gallery expires. Once the online gallery expires, so does your place at the top of our to do list. Don’t let your wedding end up at the bottom of the queue! Our studio currently photographs approximately 50 weddings each year, not to mention the many other clients and types of photography that we also do each year, so needless to say we are extremely busy. 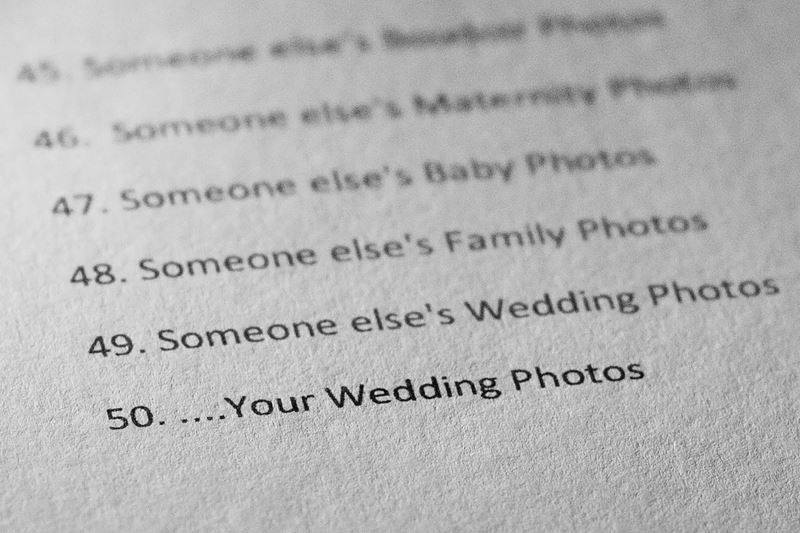 And when I say (We) I mean (Me) since I am the one who creates the photos, I am the one who processes the photos, I also print them, I design the wedding albums…yes, I do it all and I love every minute of it, except for the waiting part. I am only one person and there are only so many hours in one day I can devote to work. Why don’t I just hire more people? Because then, I would have to raise my prices by a whole lot more and nobody wants that – right? 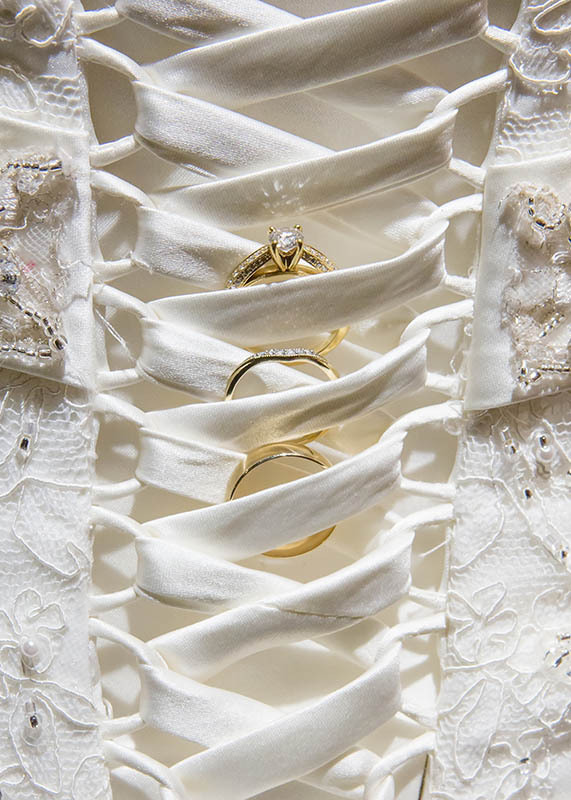 So, you may be able to see why once your wedding has reached that 90 day period, I may not seem to be as excited about it, as I was before your wedding, or on your wedding day. Don’t get me wrong… I STILL LOVE YOU and I’m looking forward to our future together. I would love to be your family photographer and continue to grow the friendship we created and have shared to date. I will always love your wedding photos and cherish those great moments and memories too, but the honeymoon is over and now I need to make time and space for my other clients too. I absolutely LOVE photographing weddings and everything about it! It’s my absolute favorite thing to photograph, but in order to provide each and every one of my clients with an equally amazing experience, I need to set some deadlines and I feel that 90 days is quite a reasonable amount of time for every client. So, what do you think? Please feel free to chime in, leave a comment below, as I am curious to know how others feel about this. Do you think a 90 day deadline is a reasonable amount of time after a wedding? Is it too much time? Not enough time? When should the “Honeymoon” period be over for your wedding photographer? What are your thoughts? Pinterest, Wedding Inspiration or Duplication? One of the things I love the most about being a professional wedding photographer is the ability to create beautiful, memorable images for my clients. Although we photograph many weddings each year, lots of times going back to the same locations over and over again, I strive to make each wedding unique by creating different looking images for my clients. My reasons for this are twofold. First, I want to make each of my weddings unique and provide fun, creative and artistic images for my clients, that they will cherish for a lifetime. If you put all of my wedding albums from the same location together in a row, you would see that the images differ a bit and are not the same pose, same place. The other reason is purely selfish. I feel that in order to better myself as an artist and keep things interesting, I need to try to create new imagery, making images at the same location, but not making the same image. This is what keeps things fresh and feeds my love for wedding photography. So, at each wedding I photograph, I try to make the images different, even when I’m at the same location. Lately, (this is happening a lot more often) I have been getting several shot lists, and links to Pinterest boards, both from perspective and future clients, with photos that they saw on Pinterest that they want me to do. While I have no problem giving our clients what they want and I will certainly do so, this practice is killing the creative process of wedding photography. Perhaps there is some confusion between the two words: Inspiration and Duplication. I love to get INSPIRED by photos that I see, not only on Pinterest, but from many other sources. But my goal is not to DUPLICATE the images that I see, but to use that as a basis for my own take on it. Use it to inspire me to create my own images. Because if I did try to duplicate an image, that does not help me grow as an artist. It just teaches me how to copy someone else’s work. It also doesn’t get my clients excited about my work…because it isn’t my work. Of the times I have duplicated and image that a client requested from Pinterest, once the client sees the image, there is no emotional connection or impact. It’s simply bland. Yup, okay good…you got that one. Yes, you got that one too. But when they see the images that I have created, that they were not expecting, that came from within me at that very moment, then I’ll get the WOW, OMG and OOHs, they have a much greater impact and are treasured much more by my clients, because they have not seen them before. They are emotionally connected to the image because it brings back memories of their special day. My Duplicated Photo for the client. I feel my clients are drawn to me and my style of photography because they like what I see when I look into my camera. They like my creativity. This is the reason they choose me to capture their wedding memories. But sometimes, someone will show me a bunch of photos they found on Pinterest and say, I want you to do this photo and this one…oh and this one too, etc… There goes my creativity! 😦 If I have to worry about a shot-list: gotta do this shot, then gotta do this one, oh and can’t forget this one, checking off each one on the list so I don’t forget any…then the entire wedding will be a duplication of other peoples photos and will not be a true representation of the reason the clients hired me in the first place. There will be no time for me to be creative, if I’m constantly looking at a list, or some Pinterest photos that I need to copy. The end result will be a wedding that doesn’t match my style and doesn’t represent my work and doesn’t provide that emotional connection for my clients. So, I just wanted to voice this to any future brides out there reading this blog. If you hire a professional photographer because you like their style and the images they have created, then allow them to WOW you with their talent. Providing a list of Pinterest photos that you want them to duplicate will totally squash their creativity and in the end, you will not like the images as much as you may have thought you would. A wedding is an Amazing Day and should be filled with images that make you say WOW, OMG and remind you of that amazing experience, not images that make you just say, yup…okay…got it…good. I feel that Pinterest is a great tool for gaining INSPIRATION. I don’t feel it should be used for DUPLICATION of images that someone else has already created. Ask your photographer to look at the images that you like and that you are drawn to. We can be inspired by them to create something unique and quite possibly better than the images that you saw and those images will have a better emotional connection and timeless impact than anything that can be duplicated. Excuse me Miss, but your Pad is showing! I absolutely LOVE being a full-time professional photographer and I can’t think of anything else I’d rather do than photograph people’s weddings and their milestone moments. But at the same time, I think one of the most difficult jobs out there nowadays is to be a professional wedding photographer. What with the onslaught of consumer point-and-shoot cameras, mobile phones, tablets, digital capture devices, personal video recording devices and more, it’s an extremely difficult task to get a really great image of the bride and groom throughout the day. Why is it so tough? Because lately, more and more guests at a wedding are not being very considerate of the bride and groom. Excuse me Miss, your pad is showing! While I don’t usually mind the many guests at a wedding taking multiple photographs during the ceremony and reception, it’s particularly stressful and also a pet peeve of mine when I’m trying to get a really awesome and memorable shot of the bride and her dad coming down the aisle, (such as this one posted here) only for it to be ruined by somebody’s digital device being stuck out into the aisle right in front of my camera view, ruining both the moment and the photograph. A wedding is one of those milestone events that you only have one chance to get right. There are no do overs! When the moment is gone, it’s lost forever. That’s why this is a source of great stress for the professional photographer (me) trying to capture that magical moment that my clients invested very good money for! I’m in position, I’m ready, here comes the moment…and there goes someone ruining it. I feel sad for the wedding couple, because they won’t get to enjoy and cherish these photos now. The shots shown here are by no means an isolated incident. A quick search online to news sites like the Huffington Post and CNN, will confirm that more and more wedding memories are being lost due to others interfering with the professional photographers shots. There are hundreds more photographs, just like these here that end up in my computer’s recycling bin instead of as part of the bride and grooms most memorable and treasured collection. With the myriad of digital devices getting bigger and bigger screens, this problem is getting even worse! So, what can we do to put a stop to this? I do understand that the guests of the wedding are anxious and excited to take photos of the bride and groom, but is it so important that they need to ruin the bride’s memories of her special day? There’s got to be another way! Do we return to the old ways and put it into our photography contracts that no one else is allowed to take photographs? 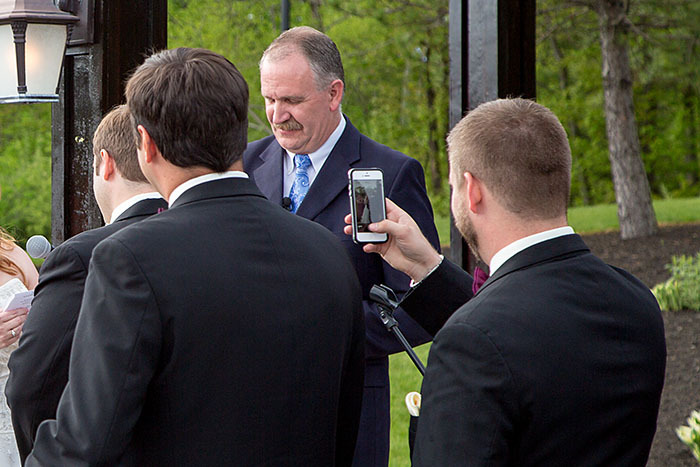 In the past, professional photographers such as myself had it written into our contracts that no other people were allowed to take photos during the Ceremony or the Formals. Over the years, this became frowned upon due to the fact that most of the guests carried with them point and shoot cameras, mobile phones with cameras and nowadays, tablets with cameras. But these old-day rules were put into the contract for good reason. 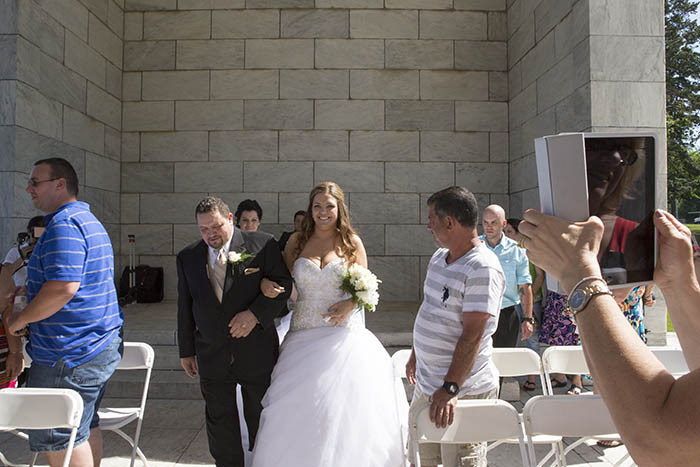 We photographers work incredibly hard to try to capture every special moment and lots of those moments are ruined either by some other camera’s flash, or by someone jerking out their device in front, just to get a shot. These bigger screen digital devices truly are disruptive to the wedding and ruin many photos throughout the day as you see from these shots. It’s gotten to be so bad that even the wedding party is pulling out phones or devices, just to get a “live” shot to upload to social media. Do you suffer from Facebook Interruptus? I find it hard to believe that guests of a wedding cannot see how wrong this is. Think of all the shots that we professionals have to throw away because of this. There isn’t just one person at the wedding doing this either, there are many, many people doing this all at the same time. You may even wonder sometimes how the professional gets any good shots at all. There has to be a happy medium somewhere that will please both the guests and not ruin the professional’s images. Personally, I feel it is up to the married couple to set the ground rules on this one. Don’t let your guests ruin your wedding photos! Tell them that you are having an “Unplugged Wedding”. What’s an unplugged wedding? Simply put, no digital capture devices. Invite your guests to enjoy the wedding, hear the beautiful words that are being shared and feel the love in the room during the ceremony. Most professional photographers will post the wedding images online and all of your guests will have the chance to see all the amazing photos taken throughout the day. 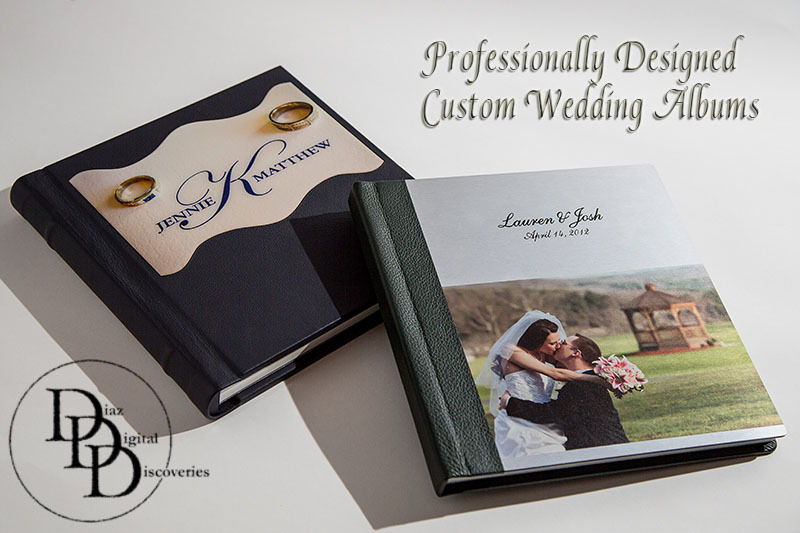 They are even available for purchase, if guests want to have a keepsake of your wedding day. I chose to blog about this today, after having this happen to me at some recent weddings and after reading several online news stories about this happening at other weddings too. My goal is only to bring some awareness to any of my future wedding clients who are reading this. As the married couple, you have every right to make special requests on your wedding day. The simplest way to take control of the situation and avoid this happening during your wedding would be to include a note to your invited guests within your wedding invitation, stating the you do not wish your guests to use their digital cameras, tablets, or otherwise during the ceremony, formals, or otherwise interfere with the professional photographers photos. You see, this information coming directly from your professional photographer to your guests, would be received in a very negative way, thereby making him or her out to be a bad/mean person. But merely all we are trying to do is ensure that you get the very best value and amazing, memorable images throughout your day, which is what you paid me top dollar to do. We work extremely hard and are 100% invested into your wedding, trying to make it the experience of your lifetime. 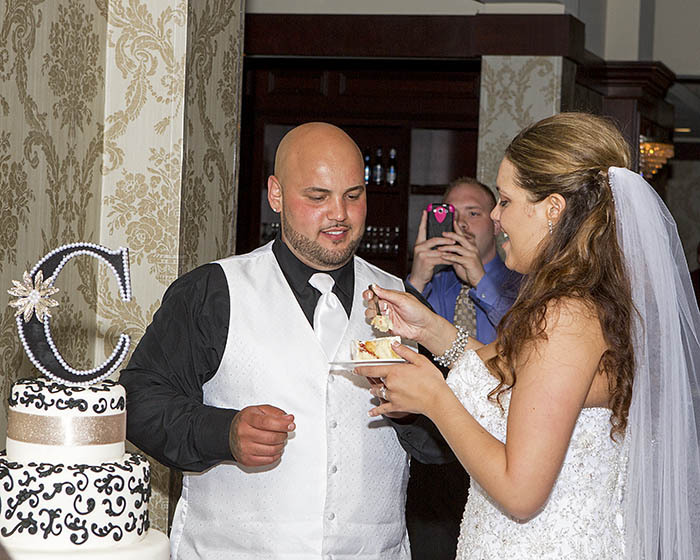 It is very, very sad when an amazing and heart-warming image that would take your breath away, is ruined by someone with a mobile device and long arms, or someone Photo-Bombing during a milestone occasion, such as the Cake Cutting. So, if you agree with me and if your wedding photography is very important to you, you may consider sending a note to your guests, along with the invitation stating that your wedding be an “Unplugged” occasion. This means asking them to refrain from using electronic devices and thereby placing them in the photographer’s way during the ceremony and formal photos. They will have plenty of opportunities to photograph the bride and groom during the reception. Unplugged weddings are gaining popularity and are the best way to get to most out of your wedding images. If you don’t agree with me and if photography is not that important, then please be forewarned that although we will do our very best to get all the great moments and images we can, some of your once-in-a-lifetime, heart-stopping, most memorable, unable to be done over, moments may be lost forever, because someone’s pad is showing, someone is photo-bombing or someone otherwise ruined the photos. Off I go to my next wedding, with fingers crossed and hoping no one photo bombs it! The Book is Always Better! Don’t try this at home brides! You are very particular in planning your wedding. Not just some of the details. All of them! Your wedding gown is no ordinary dress! It has to look beautiful on you, fit great and make you feel amazing. You may have to search far and wide, or you may find it right away. Either way…you know when you find the right one! You choose your wedding party specifically because on this day you want to be surrounded by the people (friends or relatives) you love and who love you back. You choose a hair and makeup artist, because this day is important and you have to look better than your best. You choose a Limousine company that has the right size vehicle, that would compliment and enhance that “wow” moment you seek, as you step out of the vehicle moments before it starts. You choose your ceremony church or location, perhaps your personal vows to each other and other important and meaningful details, so that everyone invited can share in that special moment with you both. You choose a Florist that can handle this most important project and who has the skill, creativity and selection of flowers you love. You choose a reception hall that is just the right fit, both to accommodate your guest list and for the look it presents, which suits your specific taste. You choose a DJ with a personality and music selection that you feel confident would really entertain your guests and “rock the house”. You choose a photographer whose work you absolutely love and you can’t wait to see the beautiful images they capture of you. You choose a caterer or a wedding cake vendor that can bring to life the creation you dreamed about, with a flavor you will still dream about, long after it’s gone. Every single detail…table cards…seating chart…favors…centerpieces…and more are chosen to bring together one of the best days of your life. You invested all this time, money and hard work, planning this day so that it is as perfect as can be. And now, you want to take all of those gorgeous, romantic, artistic, fashionable, memorable images that recorded your wedding celebration…and put them on a computer, a disc, a tablet, a phone, a website or some other piece of technology, instead of having a wedding album, simply to save a few dollars? Why? Even the couples with the very best intentions, to make their own album (because they are “artsy-crafty” people – you know) end up never doing anything with their photos. That job simply goes at the very bottom of a To Do List that gets added to each and every day. You keep saying your going to do it someday, but that day never comes. And now fast-forward….it’s been 10 years and you still never got around to making that album. It’s really sad when you think about it! Don’t get me wrong, I am not against you having a disc with your photos to post on your social media pages and all of your mobile devices. But, nothing compares to actually seeing and feeling your images and your wedding album in print. They really do look so much better, feel much better in real life! Nothing beats the feel and smell of that brand new, Premium Genuine Leather album cover. Run your fingers across the pages and feel the texture of them! Sit and relax on your couch and see the true vivid colors as they were meant to be enjoyed, not just by the limited colors that your monitor can display (Red, Green, Blue). Relive every single moment of that amazing day as you hold your wedding album in your arms. Then pass it on to your generations and let them enjoy it more and more with each passing year. Your wedding album becomes more and more valuable with the passing of time….and people. It truly is a priceless work of art. NEW PHOTO / VIDEO COMBO PACKAGE FOR 2013 WEDDINGS – LIMITED TIME OFFER! Our newest service, Wedding Photography and Videography Como Package has EVERYTHING YOU WANT and a price you can afford! Our most popular Wedding Photography package includes a full day of coverage, proof book, personalized website gallery of edited wedding images, a fully customized, custom designed 10×10, 20 page wedding album and the disc of all the Hi-resolution photos for your personal use for only $2,499. Our most popular Wedding Video package includes a full day of video coverage using a fun, story-telling and documentary approach and a professionally edited “Wedding Film” on up to 3 DVD discs, for only $1,999. Our new Photography and Video Combo Package includes a full day of photography and video, a personalized website gallery of your wedding images, a wedding photo “proof” book, a 10×10, 20 page custom designed wedding album in your choice of cover colors, a disc of all Hi-resolution photos for your personal use and your wedding film on up to 3 DVD discs for only $3,499. That’s right $3,499. for full day coverage of BOTH services! (Save $999.) That’s only $1,750 per service when you book both…and you get to keep all of the photos on disc! No need to decide whether or not to have a Wedding Video anymore. At this price, you just can’t say no to video! We have never offered a deal like this before…and we may never offer it again! Don’t miss out! Also included when you book this photography and video combo package is a FREE 2 hour Engagement Photography session. Contact us for more info and details on our new Photo/Video Combo Package. Only $600 to reserve your wedding date with this package and the balance is not due until 21 days before your wedding date. Contact us to make an appointment to meet with us and view sample albums, photos, wedding films and tell us more about your wedding day plans and wishes. Mention seeing this Ad here on our BLOG! Available to new clients only with 2013 wedding dates only. Conditions Apply. Limited Time Offer!